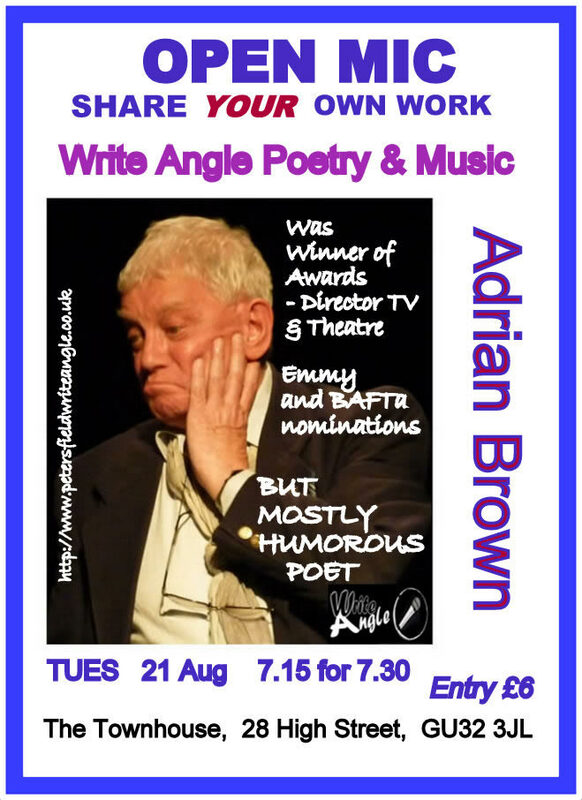 Throughout, and even before, his working life as a director of television programmes and theatre productions, Adrian Brown has been writing and performing poetry, mostly, but not exclusively, of a humorous, satirical, kind. At one time the youngest director ever taken on by the Drama Department of B.B.C. Television, he was responsible for many plays and serials, favourites being the stylish “The Noble Spaniard” of Somerset Maugham, with Margaret Rutherford and Kenneth Williams and, much later, “The Belle Of Amherst”, a study of poet Emily Dickinson with the ideally-cast Claire Bloom. This production won the International EMMY Award in New York, one of Adrian Brown’s seven awards for direction, which also include a B.A.F.T.A. Nomination. Subsequently, as Producer/Director for “Thames Arts”, a leading television arts series in the 80s and 90s, he produced programmes on the work of Ted Hughes, Adrian Mitchell, John Agard, Valerie Bloom, D. J. Enright, the dissident Czech poet Miroslav Holub and others, with the participation, at various times, of Derek Jacobi, Kenneth Branagh, Julia Mackenzie, Imelda Staunton, Ron Moody, and many more, filming in the U.S., France, Czechoslovakia, Italy, Austria and Yugoslavia, in addition to the UK. Adrian Brown has directed twelve of Shakespeare’s plays in the theatre, as well as many other period and modern works. He has been a member of the faculty for the Royal Academy of Dramatic Art, the Webber-Douglas Academy, the Guildford School of Acting and the Birmingham School of Music. 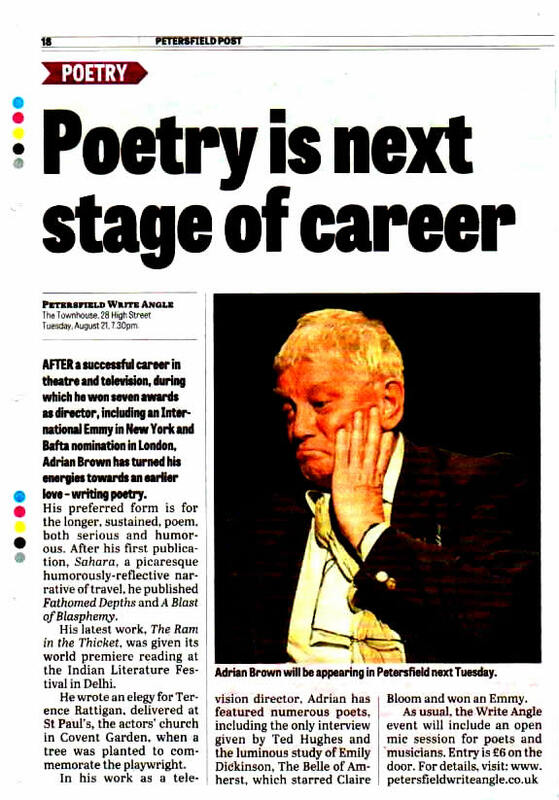 He has served on the council of the Directors’ Guild of Great Britain, of which he is now an emeritus member, and more recently as a Trustee of the Poetry Society. With this work behind him, Adrian Brown now finds time to concentrate on his own verse. His collections include “Abominable Beasts”, “Guiding Principles”, “Conspicuous Display”, “Good Lord!” (a quizzical reproach to an absent Almighty), “Sahara”, a magical nomadic trek, and “Chac-Mool”, an attack on globalisation which was a prizewinner at the Strokestown festival in Ireland. Sahara has been handsomely published by Hearing Eye Press, with other work appearing in magazines. An accomplished speaker, he has also performed work at the Poetry Society in Betterton Street, at the Arts Club in Dover Street, at the Battersea Arts Centre, the Torriano Meeting House, and the Poetry Shack, as well as readings in Germany, Italy, Mexico, Syria, Malta and Turkmenistan. His most recently published work, “The Ram In The Thicket”, a majestically gripping epic in sensuous blank verse, was premiered last December in Delhi, as part of the Indian Literary Festival. This poem takes an unsentimentally humanistic view of the biblical myth of Abraham and Isaac, and raises timely questions of the balance between faith and reason, the Leader and the Leviathan masses, between principle and pragmatism, even maybe whether there is a Truth higher than simple truth.